Evo magazine is considered the world’s leading sports, performance and premium car magazine brand. It's safe to say that Evo is a truly global magazine licensed in Australia, Bulgaria, China, Croatia, Czech Republic, Egypt, France, India, Italy, Malaysia, Middle East, Singapore, Slovenia, Thailand, Turkey and Ukraine. Yesterday marked the release of the June 2018 edition featuring our very own Alfa Romeo Giulia Quadrifoglio. At face value, you could be forgiven for thinking that Celtic Tuning’s Alfa Romeo Giulia Quadrifoglio is just another one-dimensional, big power machine. The Newquay tuner has developed a software package to take the saloon’s twin-turbo V6 from 503bhp and 442lbft torque to an even more generous 585bhp and 489lbft. With no mechanical changes involved, the necessary modifications to the ECU can be carried out by Celtic’s network of dealer and mobile tuners. Very useful if you don’t happen to live in Cornwall. During normal driving, you can feel the extra performance right from the bottom of the rev range. Small throttle movements have the car surging forward no matter what the revs of which gear you’re in, and you soon recalibrate your own ECU and use one gear higher than you would in the standard car. There’s a perverse pleasure to be had from deploying as little of the huge reserves of power as possible, using the tiniest amounts of throttle to pull away from others or overtake, safe in the knowledge that very few cars could keep up if you dropped a few gears and used more than a quarter of the accelerator’s travel. the exhaust flaps to open when the car is in Dynamic mode, so you can savour the Giulia’s louder, Race-mode exhaust noise by keep the traction and stability controls on. If you want just the exhaust modification it will cost you £400, rather than the £600 for the full package. usually the preserve of its rival, BMW’s M3. However, as the ultra-fast steering and supple yet predictable chassis haven’t been changed, it remains delightfully controllable and exploitable. Although the chassis isn’t overwhelmed by the extra power, the electronically controlled limited slip-differential doesn’t cope quite so well. 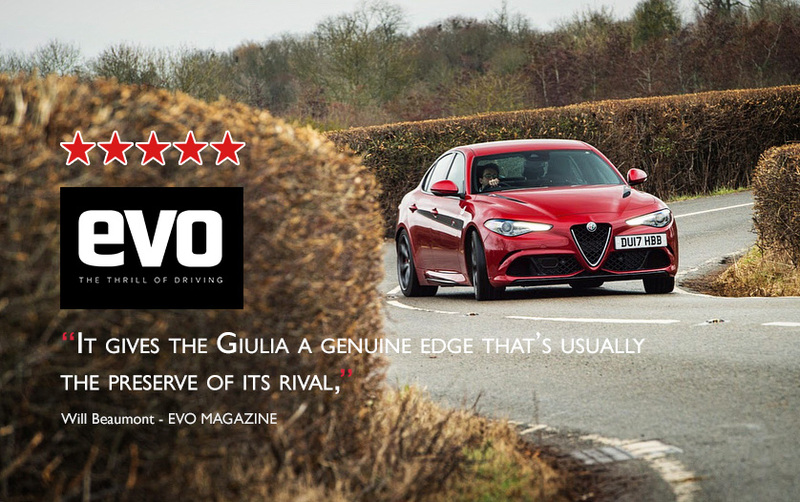 Even with the Giulia’s regular power the diff doesn’t lock up every time you think it should, then at other times it works tirelessly to keep the car straight rather than letting it react naturally to your inputs. Sadly, the extra performance magnifies the diff’s quirks. However, it’s only slightly more frustrating and certainly doesn’t ruin the experience. There’s something very grown-up about the way Celtic Tuning has approached fettling the Quadrifoglio. A 660bhp version, with bigger turbos and a raised rev limiter, is on its way too. If this 585bhp car is anything to go by it’ll be far more sane that the numbers suggest. Let’s hope the diff also gets an upgrade.